Old maps of Oneida County towns, reproduced from the Atlas of Oneida County, published by D. G. Beers & Co. in 1874. 53 Items. Showing Items 1 thru 50. NYOD013 1874 Old MAP of Oneida County, New York (NY). This historical old Oneida County map was reproduced from the Atlas of Oneida County, New York (NY), published in 1874 by D. G. Beers & Co.
NYOD016 1874 Old MAP of Annsville, New York (NY); insets of villages of Glenmore and Taberg. This historical old Annsville map was reproduced from the Atlas of Oneida County, New York (NY), published in 1874 by D. G. Beers & Co.
NYOD017 1874 Inset Old MAP of Oriskany Falls, New York (NY); Annsville & Oriskany Falls Business Notices. This historical old Oriskany Falls map was reproduced from the Atlas of Oneida County, New York (NY), published in 1874 by D. G. Beers & Co.
NYOD019 1874 Old MAP of Augusta, New York (NY); inset of Knoxboro village; Augusta and Knoxboro Business Notices. This historical old Augusta map was reproduced from the Atlas of Oneida County, New York (NY), published in 1874 by D. G. Beers & Co.
NYOD021 1874 Old MAP of Ava, New York (NY); inset of Ava Corners; Ava Business Notices. This historical old Ava map was reproduced from the Atlas of Oneida County, New York (NY), published in 1874 by D. G. Beers & Co.
NYOD024 1874 Old Map of Boonville; with Inset maps of villages of Augusta Center, Hawkinsville, & Alder Creek, New York (NY); Boonville & Augusta Center Business Notices. This historical old map was reproduced from the Atlas of Oneida County, New York (NY), published in 1874 by D. G. Beers & Co.
NYOD028 1874 Old MAP of Boonville village, New York (NY). This historical old Boonville map was reproduced from the Atlas of Oneida County, New York (NY), published in 1874 by D. G. Beers & Co.
NYOD031 1874 Old MAP of Bridgewater, New York (NY); inset of Bridgewater village; Bridgewater Business Notices. This historical old Bridgewater map was reproduced from the Atlas of Oneida County, New York (NY), published in 1874 by D. G. Beers & Co.
NYOD033 1874 Old MAP of Camden, New York (NY); Camden Business Notices. This historical old Camden map was reproduced from the Atlas of Oneida County, New York (NY), published in 1874 by D. G. Beers & Co. This historical old Camden village map was reproduced from the Atlas of Oneida County, New York (NY), published in 1874 by D. G. Beers & Co. This historical old Deerfield map was reproduced from the Atlas of Oneida County, New York (NY), published in 1874 by D. G. Beers & Co.
NYOD043 1874 Old MAP of Florence, New York (NY); Florence Business Notices. This historical old Florence map was reproduced from the Atlas of Oneida County, New York (NY), published in 1874 by D. G. Beers & Co.
NYOD045 1874 Old MAP of Floyd, New York (NY); insets of villages of Empeyville & Floyd Corners; Floyd & Empeyville Business Notices. This historical old Floyd map was reproduced from the Atlas of Oneida County, New York (NY), published in 1874 by D. G. Beers & Co.
NYOD048 1874 Old MAP of Forest Port, New York (NY); insets of villages of College Hill, Clarks Mills, Farmers Mills, Forest Port; Forest Port Business Notices. This historical old Forest Port map was reproduced from the Atlas of Oneida County, New York (NY), published in 1874 by D. G. Beers & Co.
NYOD051 1874 Old MAP of Kirkland, New York (NY); Kirkland Business Notices. This historical old Kirkland map was reproduced from the Atlas of Oneida County, New York (NY), published in 1874 by D. G. Beers & Co.
NYOD053 1874 Old MAP of Clinton, New York (NY); inset of Kirkland village. This historical old Clinton map was reproduced from the Atlas of Oneida County, New York (NY), published in 1874 by D. G. Beers & Co.
NYOD055 1874 Inset maps of villages of Lee Center, Delta, Stokes, West Branch, & Franklin Iron Works; Delta & Lee Center Business Notices. 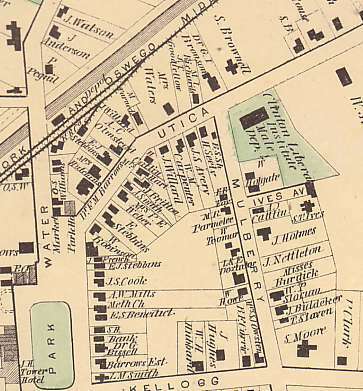 Reproduced from the Atlas of Oneida County, published in 1874, by D. G. Beers & Co.
NYOD057 1874 Old MAP of Lee, New York (NY); Lee Business Notices. This historical old Lee map was reproduced from the Atlas of Oneida County, New York (NY), published in 1874 by D. G. Beers & Co.
NYOD059 1874 Old MAP of Marcy, New York (NY); Marcy Business Notices. This historical old Marcy map was reproduced from the Atlas of Oneida County, New York (NY), published in 1874 by D. G. Beers & Co.
NYOD061 1874 Old MAP of Marshall, New York (NY); insets of villages of Forge Hollow & Deansville; Deansville & Marshall Business Notices. This historical old Marshall map was reproduced from the Atlas of Oneida County, New York (NY), published in 1874 by D. G. Beers & Co.
NYOD063 1874 Old MAP of New Hartford, New York (NY); inset of Chadwicks Mills; New Hartford (town) Business Notices. This historical old New Hartford map was reproduced from the Atlas of Oneida County, New York (NY), published in 1874 by D. G. Beers & Co.
NYOD065 1874 MAP of New Hartford village, New York (NY); New Hartford (village) Business Notices. NYOD067 1874 Inset maps of villages of Washington Mills, Willow Vale, New York (NY) Upper Mills, Utica Cotton Mills, & Sauquoit. NYOD069 1874 Old MAP of Paris, New York (NY); insets of vilalges of Paris Hill & Cassville; Paris & Clayville Business Notices.. This historical old Paris map was reproduced from the Atlas of Oneida County, New York (NY), published in 1874 by D. G. Beers & Co.
NYOD071 1874 Inset maps of villages of Clayville & Remsen, New York (NY). This historical old Clayville and Remsen map was reproduced from the Atlas of Oneida County, New York (NY), published in 1874 by D. G. Beers & Co.
NYOD073 1874 Old MAP of Remsen, New York (NY); Remsen Business Notices. This historical old Remsen map was reproduced from the Atlas of Oneida County, New York (NY), published in 1874 by D. G. Beers & Co.
NYOD076 1874 Old MAP of Rome, New York (NY); inset of Ridge Mills. This historical old Rome map was reproduced from the Atlas of Oneida County, New York (NY), published in 1874 by D. G. Beers & Co.
NYOD080 1874 MAP of City of Rome center , New York (NY) (no family names). NYOD083 1874 Rome Business Notices, 2 page (NOT A MAP). NYOD085 1874 Old MAP of Sangerfield, New York (NY); insets of Stockwell Settlement & Sangerfield Center. This historical old Sangerfield map was reproduced from the Atlas of Oneida County, New York (NY), published in 1874 by D. G. Beers & Co.
NYOD088 1874 Old MAP of Waterville village, New York (NY), western part. This historical old Waterville map was reproduced from the Atlas of Oneida County, New York (NY), published in 1874 by D. G. Beers & Co.
NYOD089 1874 Old MAP of Village of Waterville, eastern part. NYOD091 1874 Old MAP of Steuben, New York (NY); Steuben Business Notices. This historical old Steuben map was reproduced from the Atlas of Oneida County, New York (NY), published in 1874 by D. G. Beers & Co.
NYOD093 1874 Old MAP of Trenton, New York (NY); inset of South Trenton; South Trenton Business Notices. This historical old Trenton map was reproduced from the Atlas of Oneida County, New York (NY), published in 1874 by D. G. Beers & Co.
NYOD095 1874 Inset maps of Prospect village, Gang Mills & Stittville, New York (NY); Business Notices for Prospect, Stittville & Trenton (Town). NYOD097 1874 Inset maps of Trenton village & Holland Patent, New York (NY); Trenton (Village) Business Notices. NYOD100 1874 Old MAP of Utica, New York (NY); inset of Trenton Falls. This historical old Utica map was reproduced from the Atlas of Oneida County, New York (NY), published in 1874 by D. G. Beers & Co.
NYOD104 1874 Old MAP of City of Utica New York (NY) center Wards 1, 4, 5, 10 & part of 8 (no family names). NYOD108 1874 MAP of City of Utica center Wards 7, & part of 8 (no family names). NYOD111 1874 Old MAP of Utica New York (NY) Business Notices, 2 pages (NOT A MAP). Reproduced from the Atlas of Oneida County, published in 1874, by D. G. Beers & Co. This item is a two page listing of Utica businesses from 1874. NYOD113 1874 Old MAP of Vernon, New York (NY); Vernon Business Notices. This historical old Vernon map was reproduced from the Atlas of Oneida County, New York (NY), published in 1874 by D. G. Beers & Co.
NYOD115 1874 Inset maps of villages of Vernon, Verona, State Bridge & Higginsville, New York (NY); Vernon Business Notices. NYOD117 1874 Inset maps of villages of Oneida Castle, Vernon Center, & Dunbarton Glass Works. NYOD120 1874 Inset maps of villages of New London & Sconondoa, New York (NY); Vernon (Town) & New London Business Notices. NYOD121 1874 Old MAP of Verona, New York (NY). This historical old Verona map was reproduced from the Atlas of Oneida County, New York (NY), published in 1874 by D. G. Beers & Co.
NYOD123 1874 Inset map of Durhamville village, New York (NY). This historical old Durhamville map was reproduced from the Atlas of Oneida County, New York (NY), published in 1874 by D. G. Beers & Co.
NYOD126 1874 Old MAP of Vienna, New York (NY); inset of West Vienna & Vienna, McConnellsville, & North Bay; Vienna Business Notices. This historical old Vienna map was reproduced from the Atlas of Oneida County, New York (NY), published in 1874 by D. G. Beers & Co.
NYOD129 1874 Old MAP of Western, New York (NY); inset of Hecla Works; Western Business Notices. This historical old Western map was reproduced from the Atlas of Oneida County, New York (NY), published in 1874 by D. G. Beers & Co.
NYOD131 1874 Inset maps of villages of Westernville, South Western, Lowell & Westmoreland, New York (NY); North Western, Lowell & Westmoreland (Village) Business. NYOD133 1874 Old MAP of Westmoreland, New York (NY); Westmoreland (Town) Business Notices. This historical old Westmoreland map was reproduced from the Atlas of Oneida County, New York (NY), published in 1874 by D. G. Beers & Co.